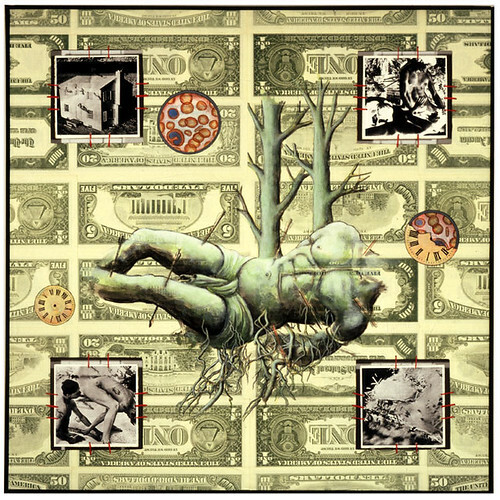 Colbert: Doing artspeak & the Wojnarowicz controversy in one fell swoop. The bit begins at about minute 2:00. Brilliant. Fire in my Belly: Or how the Smithsonian capitulated to right-wing interests. In the event that you haven’t been following, the Smithsonian engaged in a spectacular act of cowardice this past week. The short of it is that the museum removed a video by artist David Wojnarowicz from Hide/Seek, a queer-themed show at the National Portrait Gallery, after the Catholic League complained that the work was anti-Christian. Since then, the artist’s work has turned into a whipping boy for the far right (namely, no one who has seen the video or the exhibit). Following the hubbub, the Smithsonian removed the piece, despite the fact that not a single museum attendee had complained about it. The video, titled Fire in My Belly, is a meditation on the AIDS epidemic, created in 1987, when the pandemic was in full and fatal swing. Needless to say, it’s extremely worrisome (and enraging) to see a museum buckle to special political interests in this way. Not to mention that it’s anti-intellectual and censorious. ArtInfo has background on the story. PPOW, the gallery that manages Wonjarowicz’s estate has issued a statement criticizing the move. 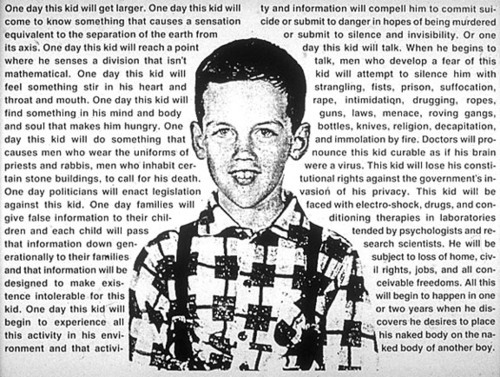 They also have Wojnarowicz’s video online for viewing. The Smithsonian has released a pathetic response on why it capitulated to a political interest group. Over the weekend, a couple of protesters got arrested detained at the National Portrait Gallery for playing the video on an iPad and handing out fliers. See a video here. The New Gay has direct e-mail addresses to the Smithsonian officials in charge of this mess. Let ‘em know what you think. If you live in New York, you can check out the video at the New Museum, now playing in the lobby – for free! If you read one story about this, make sure it’s Christopher Knight’s take over at the L.A. Times, in which he explores the anti-gay nature of the right-wing protest over the show. LATE ADDITION: My 101 on the controversy over at WNYC.